The combination of unprecedented resolution and light gathering power will not only provide unique images of objects at all scales of the universe, from planets to clusters of galaxies, it will also allow their detailed spectral analysis, thus revealing their nature, kinematics and characteristics. CANVASSING THE UNIVERSE Universe or Universes ? Engines of change: the first stars ? As the light we receive from distant objects had to travel considerable distances, the further we probe into the universe, the younger we see it. Peering into the deep universe is akin to reading a whole "biography" from birth to old age, with tantalizing glimpses on its conception. Most theories of the earliest universe require an initial set of 10 or so spacetime dimensions. The majority of these "compactified" at an early time, reducing the effective number to the present four (time and space), over a short time during which various "constants" of nature converged towards their present values. If we can observe suitable phenomena at epochs so early that the extra dimensions were not yet negligibly small, deviations from present-day values of these "constants" (including the fine-structure constant, the proton-to-electron mass ratio, the gravitational constant and the speed of light) should become apparent. Different theories predict different rates of change for different fundamental physics "constant". Some theories even postulate multiple Universes. OWL may allow -perhaps- the first experimental investigation of whether our Universe is unique or not by reaching deep into its past. In its early ages our Universe was opaque. After a mere 400 million or so, the first sources of intense radiation -possibly the first generation of stars and/or super-massive black holes- almost fully re-ionized it. By way of nuclear fusion, stars burn light elements into heavier ones, thereby progressively enriching the chemical distribution of elements in the universe. The first generation of stars did not hav e any heavy element, and as a result were markedly hotter, and shorter-lived than their successors. They also carry a distinct spectroscopic signature, quite different from that of present ones. A telescope the size of OWL is required to detect and analyze this primordial stars and the galaxies they formed, and find out which were the sources of re-ionization. It will do so, not only in visual and near-infrared wavelengths, but also at mm wavelengths, looking at dust-shrouded stars and galaxies which contribute to about half of the total stellar energy output in the whole Universe. Galaxies are the essential "building blocks" of the visible part of our Universe. They come in a wide range of sizes, morphologies, and stellar populations. Their nuclei may host some of the most energetic physical processes by which a volume of space smaller than the Sun can outshine the entire Universe for a few seconds. They have been detected to the farthest reaches accessible to modern telescopes, yet only the nearest can be resolved into stars and analyzed properly. OWL will be able to resolve stars at much larger distances an in particular peer into the purely stellar elliptical galaxies, now almost devoid of any gas, and all too far from us with present observing capabilities. 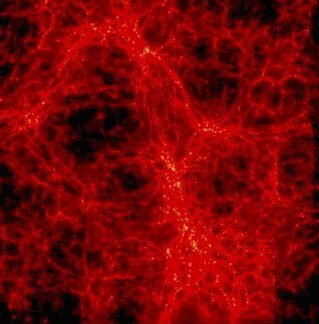 Simulation of a patch of the Universe at early times, (B. Moore, Institute for Theoretical Physics, Zurich). As our Universe began its first five hundred million years of existence, the delicate cosmic tapestry of galaxies began to form. Driven by dark matter seeds planted at its very birth, intense star-forming regions appeared along titanic-size "walls" connected to each other like in soap-bubble foam. In those early days, when the Universe was but a fraction of its present size, these groups of proto-galaxies were closely packed and thus intensely interacted through gravitational attraction. True to age-old human experience, during this ferocious cannibalism stage, the bigger galaxies swallowed the smaller ones, becoming even fatter in the process and evolving into the giant galaxies of today, such as our own Milky Way. OWL will be able to study myriads of galaxies caught in the full act at meal time and will quantitatively gauge how this process has shaped the visible Universe. In the past few years, exoplanets have been discovered at an increasing rate, with already more than 100 identified. No direct observation is possible with existing telescopes; the existence of these planets is generally inferred from the minute perturbation of their parent star's motion. Closer to us, solar system objects are periodically visited by space probes, which provide spectacular but short snapshots of our neighborhood. Those limitations will no longer hold with OWL. Perhaps the Holy Grail of present-day astronomy would be the detection of biomarkers on earth-like, or perhaps even not earth-like, planets around other stars. This is being attacked with both flotillas of free-flying satellite interferometers in space or single giant telescopes on the ground. Both approaches are technically hugely challenging and clearly very long-term; yet they are bound to be pursued in earnest by most major astrophysical projects and, certainly, by OWL.
. at extremely low cost. After the known unknowns, the unknown ones. It is a constant historical trait that telescopes became famous not for what they were built for, but for totally unexpected discoveries that opened entire new chapters of astrophysics. As one of many examples, the 3.6 m telescopes at La Silla and Hawaii were developed in the 70s, the first to refine stellar evolution through studies of the Magellanic Clouds and the second to detect fainter farther galaxies. Yet both teamed to unexpectedly discover gravitational arcs in clusters of galaxies, which besides being a beautiful example of gravitational optics, constitute the gauge to weigh individual galaxies, clusters of galaxies and even the whole Universe, which was sorely lacking in the astronomer toolbox. We may expect, or at least hope, more of the same from OWL!